If you subscribe to my newsletter, then you heard me rave about a recipe I tried a couple weeks ago: Kindred's Milk Bread. Kindred is a restaurant just outside of Charlotte that is amazing on its own. But what makes it even more amazing is the bread they serve when you sit down. Their milk bread is light and airy but also has this butteriness like a croissant or brioche. After making it the first time, I knew I would be making this bread a ton and in a ton of different ways. First on the list: this cinnamon roll bread. 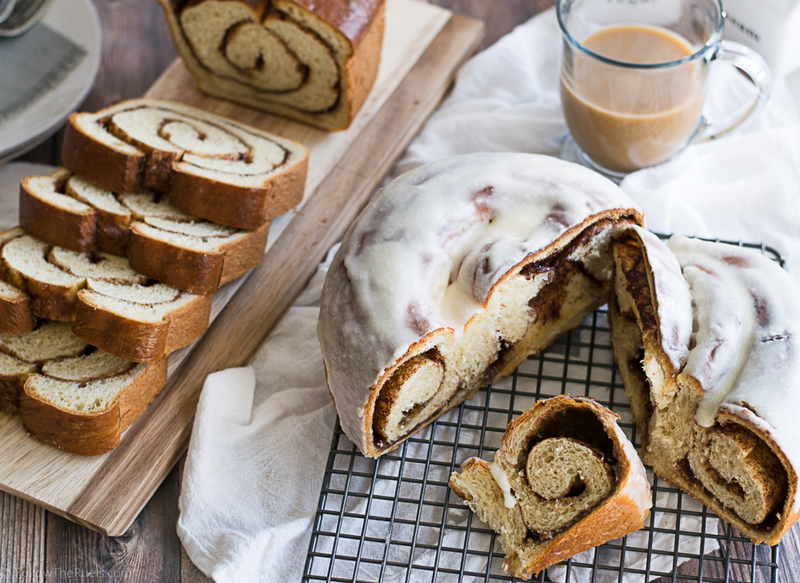 This cinnamon roll bread almost blows the original milk bread out of the water (almost). While the bread is awesome on its own, adding a little cinnamon and sugar never hurt nothin' (pretty sure that is what should be written on my tombstone). Not going to lie though, this recipe is a bit of a commitment. Well, most breads are. But this one especially. I can assure you that it completely worth it. It may seem like there are a lot of steps, but it is actually pretty fool proof. Start by making a slurry of water and flour in a sauce pan over low heat. Stir until the slurry thickens into a paste like consistency. Pour in the cream and honey and stir until the honey has dissolved. Pour the mixture into the bowl of a stand mixer and let it cool for about 5 minutes. Then sprinkle yeast over the mixture and let it bloom, basically it should be really foamy and bubbly. Add the flour, eggs, milk powder, and salt and mix with the dough hook until it forms a solid ball of dough. 1 tbsp at a time, mix in the butter. It may stubbornly just smear around the side of the bowl, but if you are patient, it will work itself in and form layers of butter within the dough. Form the dough into a ball and toss it (don't actually toss) it into a greased bowl. Cover the bowl with some plastic wrap and place the bowl in a warm place to let rise. The recipe will make enough dough for two loaves of bread, so split the dough in half and loosely wrap one of the halves in plastic wrap and place in the fridge. With the other half, roll out into a large rectangle. The short side of the rectangle should be as long as your loaf pan. Spread some softened butter over the dough then sprinkle a sugar-cinnamon mixture over top. Starting from one end, roll the dough into a spiral. Place the dough into the loaf pan and let it rise again. Brush an egg wash over the top so that the crust get's nice and golden brown. You can see that I split the top of the bread. That is totally unnecessary. I would recommend that you just leave it unsplit...it just looks better that way. If you don't want to make a loaf...or if you want to bake the other half of your bread...you can instead make it into a large roll. Instead of rolling the dough from the short end, start rolling from the long end and make a really long log. Then you can roll it into a spiral and pop it into a cake pan. Then let it rise and give it a good egg wash. Since I made both halves of the dough (because you can never have enough bread) I decided to mix things up and glaze the round loaf with a simple icing with butter, milk, and powdered sugar. Holy cow...it was like eating an oversized cinnamon roll. By that I mean amazing! But really this bread is perfect all on its own or just with a tiny spread of butter. There is no wrong way to eat this bread. Seriously, it's so good. I will be making this bread again and again. It seems like the perfect thing to make for Christmas breakfast, Easter brunch, baby showers, or just any Tuesday. Transfer mixture to the bowl of a stand mixer fitted with a dough hook. Let mixture cool until it is just warm to the touch and sprinkle yeast over top. Let the yeast sit until it starts to foam. About 5 minutes. Add milk powder, salt, 2 eggs, and remaining flour. Knead on medium speed until dough is smooth, about 5 minutes. Add 4 tablespoons of butter, a piece at a time, fully incorporating into dough before adding the next piece, until dough is smooth, shiny, and elastic, about 5 minutes. Punch down dough and divide into two equal sized portions. Roll one of the halves of dough into a large rectangle. Spread four tablespoons of butter over the surface of the dough. Mix together the sugars and cinnamon. Sprinkle half the mixture over top. Roll the dough into a spiral from the short edge of the rectangle to the other so that it forms a log the same length as your loaf pan. Place the dough into the greased loaf pan. Cover with plastic wrap and let sit until it rises above the level of the pan. About 1 hour. Repeat with other half of the dough. Whisk together the other egg with 1 tablespoon of water brush over top of the loaves. Bake at 375 degrees for about 45 minutes, until the outer crust is a dark golden brown. If the crust starts getting too dark, cover with tin foil. If glazing the bread, whisk together the glaze ingredients until smooth. Pour over the tops of the loaves.